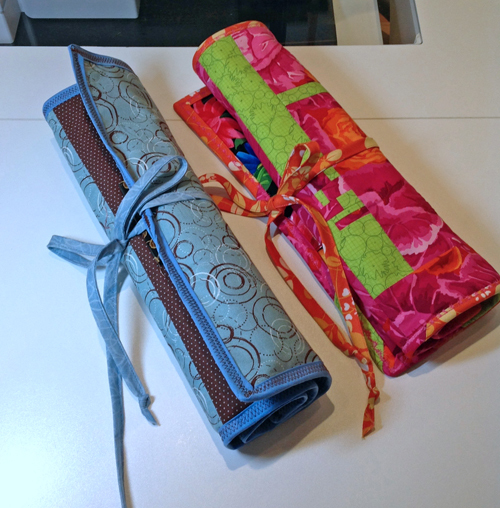 Cut enough 2-1/2″ wide bias strips to bind the edges plus about 50″ for the ties AMOUNT? (If using a bias binder, cut strips the width of your binder. Laminated Interior: Fuse the lightweight cut-away stabilizer to the wrong side of the laminated cotton following the manufacturer’s instructions. Don’t use a hot iron, as the laminate could get sticky or melt. Set aside. Inside Pocket: Place the two 4″ x 20″ rectangles (cotton and laminated cotton) right sides together, matching edges. 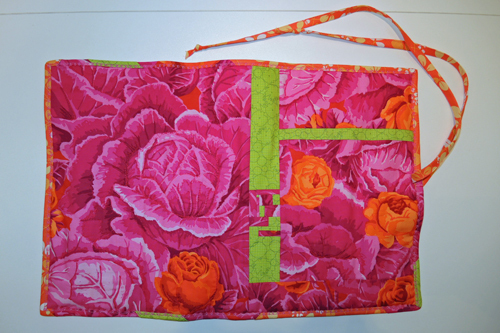 Stitch along one long edge using a 1/4″-wide seam allowance. Flip open and fold wrong sides together. Press from the cotton side so the seam is toward the laminate fabric. Set aside. Long Paint Brush Holder Guide: Fold the long edges of the 3-3/4″ x 20″ strip of laminated fabric 1/4″ to the wrong side. From the right side, use a non-stick foot to topstitch about 1/8″ from each folded edge. Binding and Ties: Sew the bias strips together on the diagonal to reduce bulk at the seams. Fold the strip in half lengthwise, wrong sides together, and press. Open and fold the raw edges in to meet at the center/crease. Press. Cut one 23″ and one 25″ piece from the folded binding. Edgestitch along the open folded edge to create the ties. Tie a knot in one end of each piece; the other end will be attached to the paintbrush holder later. 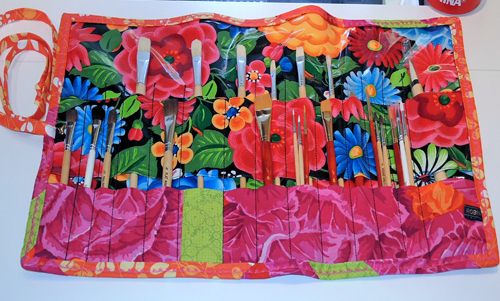 Tip: Before assembling the paintbrush holder, use decorative fabrics, quilt squares, modern pieces, etc. to add your personality to the outside and to the inside pockets. Place the main laminated piece right side up. Place the inside pocket on top, cotton side up (laminated side in), and align the raw edges at the bottom and sides. Baste 1/8″ from sides. Place the long paint brush holder guide right side up about 1-3/4″ to 2″ above the inside pocket, aligning the sides. Baste 1/8″ from the sides. Starting at the left, 1-1/2″ from the left side and 1″ above the long paint brush holder guide, sew a straight line all the way to the lower edge of the inside pocket. Continue parallel lines, moving from left to right, spacing them 1″, 1-1/4″, 1-1/2″, and 1-3/4″ apart as desired. 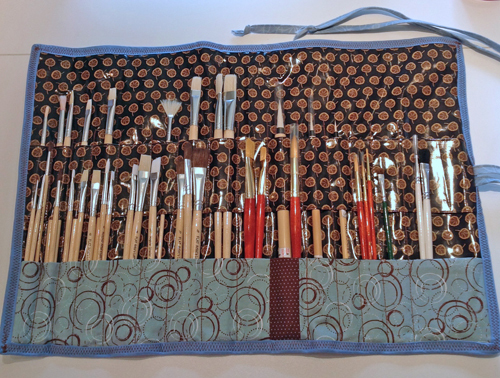 Leave a larger pocket at the right side, about 3-1/2″ wide, to accommodate brushes of different sizes. Be sure to use the non-stick foot since you will be sewing on top of the laminated fabric. You will have about 13-15 pockets for brushes depending on the spacing you choose. Tip: Use a seam guide that attaches to the presser foot rather than the machine bed. Adjust the width as desired, then stitch parallel lines by aligning the guide with the edge of the project or a previous row of stitching. Using an overlock stitch and the overlock foot, stitch around all layers to secure them together. Tip: Instead of a sewing machine overlock stitch, use a narrow three-thread overlock on your overlocker/serger. Place the raw ends of the ties together about halfway down the right side of the roll-up, one on the top layer and one on the bottom layer, just offset from each other. Baste in place. Bind the edges of the roll-up, taking care not to catch the loose ends of the ties in the stitching. I used a decorative stitch to secure the binding in place. Previous Previous post: Did you make it to the International Quilt Festival in Houston this year? Thanks for the great idea and instructions! I made one of these as a gift for my husband’s upcoming birthday; he paints miniatures for roleplaying and wargaming. I used The Walking Dead fabric, because what else will I use it for? Anyway, I made it at a retreat where we were also making projects from a published book, and your instructions were FAR AND AWAY more complete and more helpful. Thanks again! I wish the site let me share photos!